The perfect, trouble-free way to fill your home and garden with spectacular autumn blooms. Great for late summmer colour and perfect for cut flower displays. Brighten your garden when other flowers are fading late summer. Each plant will produce 5 or 6 tall strong stems of flowers ideal for floral arrangements. Perfect for growing at the back of a border for for planting in pots with canes for support. Suppplied as a collection of 24 jumbo plug plants - 6 each of 'Spray' and 'Bloom' varieties. This is the ultimate chrysanthemum collection – 24 of the biggest and best varieties guaranteed to make a massive impact in your garden! Chrysanthemums are a much loved, classic cottage garden favourite, due to their beautiful clusters of ball-shaped flowers. Nothing heralds the arrival of autumn in the garden than a garden flushed with their gorgeous blooms. 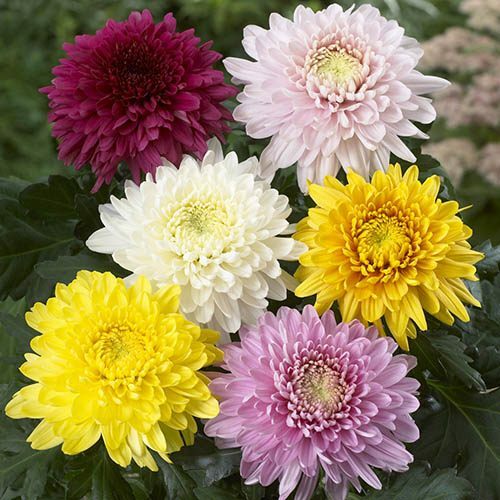 ‘Spray’ and ‘Bloom’ Chrysanthemums are the beautiful classic old-fashioned types, with glorious 8-10 inch blooms in a mix of orange, pink, yellow and purple. Planted in a mixture these will create simply stunning features! Chrysanthemums have a long flowering period, so you can enjoy their huge, impressive displays all summer long, typically from the end of July through to December. Often used to create impact in florist’s bouquets where they come at a price, this collection is incredible value for money and you’ll be able to cut them from your own garden and create your very own unique displays in vases indoors. These are hardy, shrubby perennials that will return every year to delight with their showy blooms. They are so easy to care for and they thrive when well-watered but require very little pruning. They produce their tight, balls of colour naturally, and don’t need any help achieving or maintaining this shape. Contains the following ‘Garden-Ready’ jumbo plug plants: 6 x Garden Spray Varieties and 6 x Garden Bloom Varieties. As soon as plants reach around 6-8in in late May or early June, pinch out the top growth, taking it down to three or four leaves up from the base of the plant. This promotes the formation of side shoots and you'll create a bushier, more floriferous plant. If you want one large flower per stem, you will need to disbud the plants. As they grow, remove all the side shoots to create one strong stem which will produce one flower. Chrysanthemums tend to snap at the base of the stems, so staking is really important. The stakes should be tall enough to accommodate the plant, but short enough for the flowers to be above of it; check the height of the varieties you have purchased.